Listen to Quatuor Atahualpa 's Guitars, it means to accept without any compromise the invitation to dream and poetry where South American Soul reappears: one very rare musical moment, full of subtlety, sensivity and virtuosity. Exceptionnal meeting between artists and a continent which don't finish to amaze us by its prodigious musical richness. 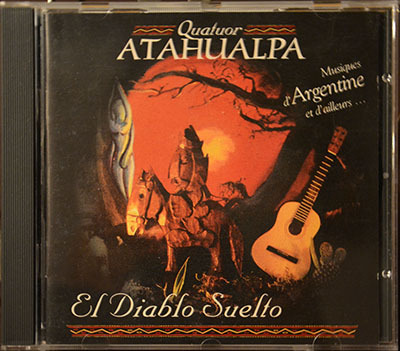 ATAHUALPA QUARTET is imposed not only by the quality of its performers, but he surprised by the originality and the rarety of the parts he proposes : true gems of South American Music. Some compositions, now classic, as Paraguayan Dance by Barrios, are revisited with much freshness and density. But most of them are coming from folklore and brilliantly arranged by Raul Maldonado. Sometimes overflowing joy and mischief , sometimes imbued with a sweet nostalgia, that music opens the doors of a wonderful musical journey from the foggy Altiplano to the warm land of tropical flowers. It is initially confused by these playful polyphony derived sometimes but so slightly toward melancholy. Nevertheless, they are sown enough with liveliness and sparkle to remind us that at the beginning of the music and of the world, there is dancing. Fabulous Firulete! Leaping, gushing Candombe ! Stories without words but emotionally charged .